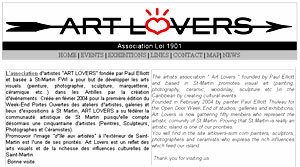 The artists association " Art Lovers " founded by Paul Elliott and based in St-Martin promotes visual art (painting, photography, ceramic, woodinlay, sculpture etc...) in the Caribbean by creating cultural events. Founded in February 2004 by painter Paul Elliott Thuleau for the Open Door Week End of studios, galleries and exhibitions, Art Lovers is now gathering fifty menbers who represent the artistic comunity of St Martin. Proving that St Martin is really an artistic island is one of our priorities. You will find in the site artlovers-sxm.com painters, sculptors, photographers and ceramists who express the rich influences which feed our island.